VLM has cancelled flights from London City and Zurich to Antwerp following a vote by shareholders to dissolve the airline. The cancellations follow the decision in August to discontinue other routes, including those operated from Aberdeen and Birmingham. The company filed for bankruptcy in 2016 but managed to continue operating following a cash injection from investors in China. In a statement on VLM's website the company confirmed it was going into liquidation. The Civil Aviation Authority has updated information for VLM customers. 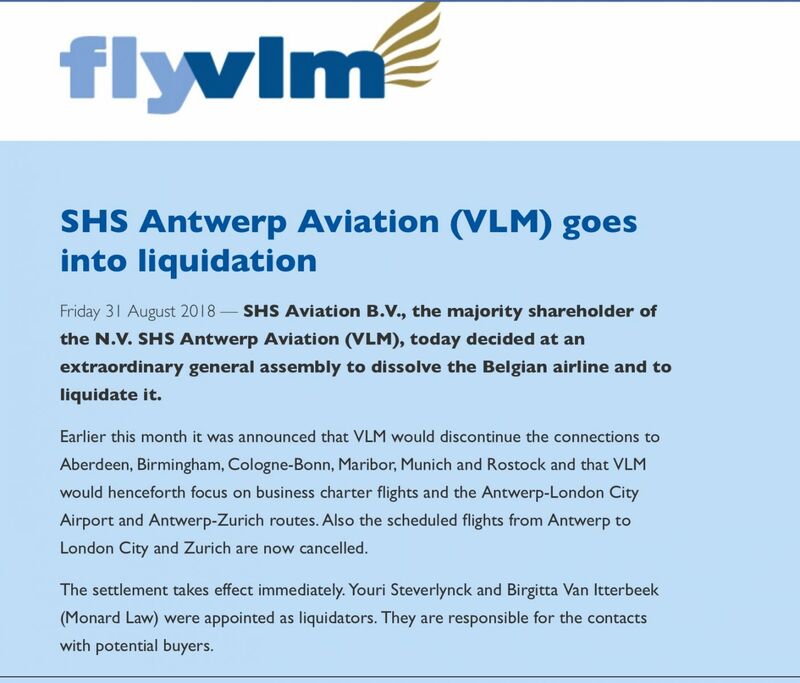 The CAA information says: "FLYVLM, a Belgian scheduled air carrier which operated services from various points in the United Kingdom, ceased operations on 31 August 2018. "FLYVLM is not covered by the Civil Aviation Authority's ATOL Protection scheme which only covers passengers booked on a package holiday. "Passengers wishing to obtain a refund for unused tickets will need to contact the company directly. Passengers who booked directly with the company via either a credit, charge or debit card may alternatively be able to make a claim against their card provider. "Passengers who have travelled will need to make their own arrangements to return home. They should contact their travel insurer or travel agent for assistance." For the full CAA statement, click here.